In Remembrance and honor to those brave men and women who have served our country to keep us free and to those that continue to sacrifice each and every day for America, we give our heartfelt thankfulness. My Father Joseph,fought for this country in WWII on Omaha Beach in Normandy France. He used to say, "I wouldn't give you a nickle for my experiences, but, I wouldn't sell them for a million dollars either" Words from a proud and glad to serve, American! I dedicate this Memorial Day to him and the bravery he carried as he jumped off the ship and swam to land on Omaha Beach with his fellow soldiers. God was with him that day as he ran forward to defend America. Happy Memorial Day and Blessings Always! 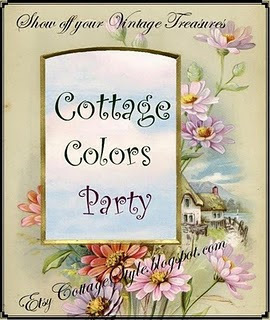 From Etsy Cottage Style, Cottage Colors Party for May ~ Yellow! All this week at Etsy Cottage Style Blog we are showing our cottage colors sharing treasures we love with the color YELLOW. I have learned over the years that I like the color yellow in accessories or as an accent color, but I do not like it on the walls. Thus a bathroom redo in the works which I will share soon. But for now, on to the party to celebrate yellow for the month of May. As I walked around my cottage I realized I have a little more yellow then I even realized. So to start I will share one of my favorite rose bowls that is displayed on the fireplace mantel at the moment. Have a cozy rest in this soft darker yellow guestroom chair. This Tuscan pitcher is a real favorite for long stem flowers and I found it about 9 years ago at Hobby Lobby down the 80% off aisle. It had one little chip that I filled in with paint and wha~la, like new! Another favorite pitcher used for ice tea is this one in a very soft yellow. Looking through my collection of cookbooks, I noticed this one for Springtime from Gooseberry Patch with a yellow binding. And, among my garden books I have this vintage gem with a yellow background. Very dear and very old is this sweet needle holder book my mother created in needlepoint many years ago. For many years I have collected metal vintage signs that are displayed in the pantry off my kitchen. Here are a few with a bit of yellow! In another room I have a touch of yellow by accenting with these red and YELLOW Poppy flowers. They always remind me of my grandmother who grew the most gorgeous Poppies. Pretty pillows with a touch of yellow. which sits a top one of a pair of vintage yellow nightstands. Letters and stationary find a spot in this yellow with red rose organizer. I love the yellow face of my large porch rooster. And the yellow roof of my garden fence birdhouse. Sweet is the yellow of this vintage bird vase. Just picked for you from the garden is my Yellow, New Day Roses or the Yellow Rose of Texas in my garden! Lastly, I leave you with an angel from my collection holding a yellow rose. 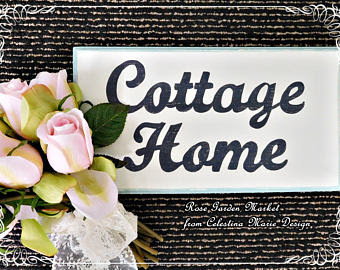 Thank you for visiting Etsy Cottage Style, Show Your Colors Party today. The fun goes on all week and each day new participants arrive so visit again HERE if you'd like to see more treasures. Enjoy! 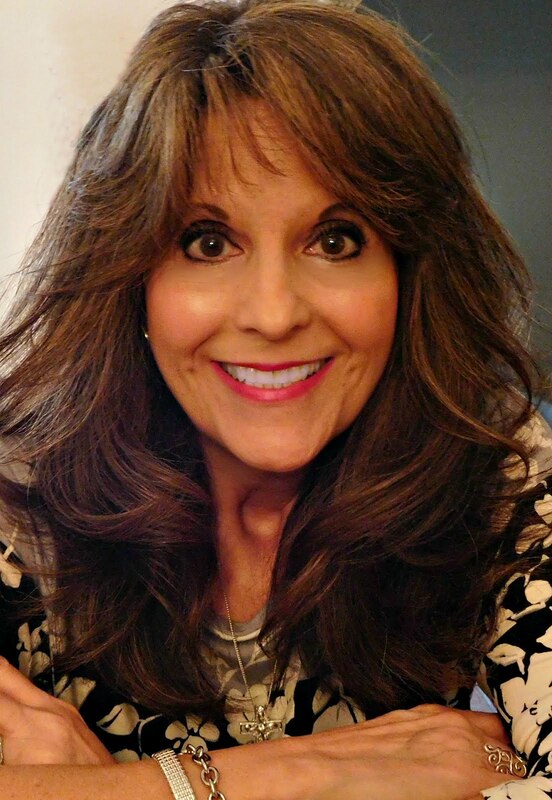 As most of you know and have followed my blog from the beginning, I am a decorative artists and interior display decorator. I have been so blessed to work in a field that I love and have tons of fun doing. For many years on my journey and for the creating of all types of styles from primitive, folk art, country and the romantic style of today, I have meet and made friends with so many wonderful people who have supported me in the arts with their valued patronage and friendships. My thanksgivings over the years has filled 2 scrap books full of cards, emails and letters from wonderful people taking the time to write about their treasures purchased. I am truly humbled and so appreciative. These scrap book treasures are my valued and cherished gifts that I can visit anytime for a gentle reminder to carry on. Carry on when the going gets rough, the days are long and overwhelming and for the times when the creative juices need a pick me up. Recently one of my long time special customers, J.Melissa, purchased my tea table and birdhouse to add to her ever growing collection of romantic decor. When communicating with her, I merely commented that I would love to see some pics of how she used some of her treasures over the years and would love to share them in a feature. Not really sure she would respond or even have time to comply. People are as busy as myself and we have limited time for anything extra. Well, to my thankful surprise, J. Melissa sent not only some pics, but wrote a little of how she has her treasures displayed in her lovely cottage home too. So to thank J. Melissa for being so kind and truly a gracious lady, I share with you the letter and pics she sent. I first discovered Celeste on eBay in the Spring of 2007. I immediately took a liking and love for most of her items. That Summer I probably purchased 15 Pretties total. Then she moved to Etsy, and in the last year and a half, I have purchased many more of her items, as my budget will allow. Most of my items are on this 5 Tiered Shelf unit. I display most of my treasures because they are really too pretty to use, and I do not want to wear the paint off. On the first shelf is a flower pot (too pretty to use), Recipe Box and a Dog Photo Frame with 2 of my Angels. The second shelf has a wood Carry-all Tote with assorted bottles and sachets. The beautiful back metal tray is in the blue Beach Cottage style. The bookends are from another artist. The third shelf has two wooden old-fashioned Sewing Drawers. In the front is a little basket, and in the back is a saucer in the blue Beach Cottage style. The top one has a really neat, old-fashioned style lunch box. I would love to take my lunch to work in it, but it is just too pretty to use! So instead, I display it with the two matching candle sticks, filled with a rose painted Bible, 2 rose heart boxes and painted rose note cards, all from Celeste. The bottom shelf has a really nice treasure - I love cake covers. I was a cake decorator for many years and I love to bake, so I really like to see these painted cake toppers. I have it displayed on a clear glass pedestal stand. The little table next to this shelf is my newest treasure. I have just a simple rosebud vase on top, so that I can easily grab it and place it in front of the couch, for when I am eating and watching television. This is the table next to my couch. At the top of the photo is the Birdhouse that I just acquired - really neat and beautifully painted with details from Celeste. It is sitting on a Counted Cross Stitch Rose Clock that I made over twenty years ago. See - I have loved roses for a long time! In front of that is a very heavy bowl that is painted with various flowers in multiple colors. I found the perfect thing to put in there, those are yellow and pink rose floating candles that I think adds the finishing touch and really brings out the colors of the bowl. At the base I tied a white ribbon. The lamp may look a little silly, but it was too short for the table, so I put it on top of an old Ice Bucket that I purchased from Celeste in 2007. Still fits my style design. In my kitchen above my sink is this display! At center is the most beautiful Serving Party Platter. Most people would display it on a table, but I think it looks really striking on my Mint Green painted walls. To the left is a Heart Cake Mold, a wooden Cupcake Ornament and two wooden Serving Spoons. The Cutting Board is from another artist. I have too many items to fit into the perfect spot, so I now just display the overflow items together on my casual Buffet Hutch! In the center is the most striking old-fashioned Washing Water and Bowl. I got this in 2007 and first put it in the bathroom, but it was getting too much moisture and hairspray on it, so I brought it out to my living room. From left is a wooden box with a Fairy on top. 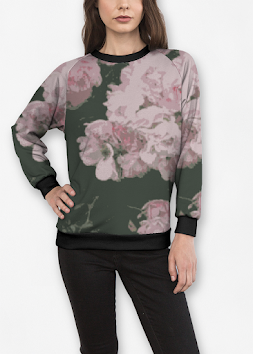 Sometimes I display this open because the inside is painted pink with a large rose on the lid - really striking! Standing up is a Flower Tray that can be hung up if I so desire. Two different bowls - the one at left is a perfect match to my candlesticks on the 5 shelf unit, and the one at right has more reddish roses with green leaves that has a Christmas look to it. I still display it year round. Laying flat are two rose spoons that can be hung. On the right are two glass votive holders and a lovely Lace Box that I prop up so that it can clearly be seen. The pillow in the back is a Counted Cross Stitch project that I made in 1988. I do have some items that I really do use! One is a Tissue Box Cover and the other is a Message Board that I keep above my desk - too messy to show! I hope that you have enjoyed looking at my prized Celeste Treasures that I certainly enjoy looking at daily. I want a beautiful home and this certainly helps greatly, they cheer-me-up and make me so happy to be here! Thank you so very much Melissa for sharing the use of your hand painted treasures and your wonderful cross stitch talents and pretties too. You have blessed me more then you know and give me the encourgement to continue My Creative Journey. So back to the studio I go as I just filled the shelves HERE with many more new hand painted treasures for you to browse. With Springtime in full bloom and warmer days finally here, I was inspired to share a painting I did from an art book study years ago. The book is, Birds in My Garden by Barbara Baatz Hillman. This wood box piece is shaped like a fan and slides open to hold small keepsakes or wrapped candy. The perfect little accent for a coffee table. As I view the hummingbirds in my own garden I love to watch these amazing and gorgeous little birds work so hard and suspend in one spot in the air drinking from a feeder or enjoying a flower in full bloom. The skill, strength and stamina for such a feat is just beautiful to watch. My dear guy loves to observe the birds in our garden too and has hummingbird feeders for these elegant birds to enjoy throughout our garden. The beautiful Hibiscus flowers are a favorite of mine to paint and grow, but our Miss Beazy loves to eat them, so I have to plant in an area she can not reach. Decorative Design Artist and member of the National Society of Decorative Painters, it has enriched my world, not only as a designer, but challenging me with a skill level to push my creativity. 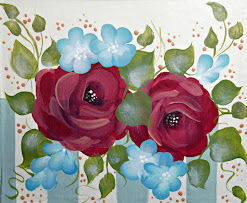 Thank you for joining me today for a view of decorative painting from my own personal collection. I will share more from my collection in the future and till then, I will be over in my etsy shoppe filling the shelves with a few more treasures designed last week. See you soon and have a blessed and wonderful week. Here we are~~back to Monday, which I have always loved. When Monday rolls around I find the day all anew, refreshing and the start of a terrific new week if we choose to approach Mondays with a great outlook. Hope you all enjoyed a wonderful weekend. Here in Texas we were met with a warm 92 degree day and mild winds. The flowers did not disappoint and came out for a gorgeous show of color and greetings. As I walked around my garden, I could not help but take a few pics of the gorgeous flowers. Thankful for my many blessings and grateful for another Mother's Day. I truly miss my Mother, but I know she is always close by and never more nearer ~ then in my garden. I hope you enjoy a few blooms I have to share this Spring, starting with the gorgeous 20 Red Tulips from my son. The scent is heavenly. Also, Mr. Lincoln's Rose bloomed with a gorgeous spray for a perfect bouquet. Aren't they pretty? Thank you for taking a little walk around the garden with me this new Monday. I hope you are off to a great week. For me, it is a busy day filled with happy paint brushes and lots of plans for new creations.